I promised to one of my Russian speaking readers to write this post about lacemaking in miniature. I have a special tag for it on my site, so you can check the previous posts. And here I decided to show you my favourite books and DVDs that helped me a lot. I started with Russian tape lace, I bought several pairs of Russian bobbins and some books. The process was quite easy until I had to make some stitches that turned to be difficult to make when all you had was a vague description in a book. I went on Youtube and found out that all the good videos were in English and Spanish! 🙂 This was the moment when I decided to start with Torchon lace. 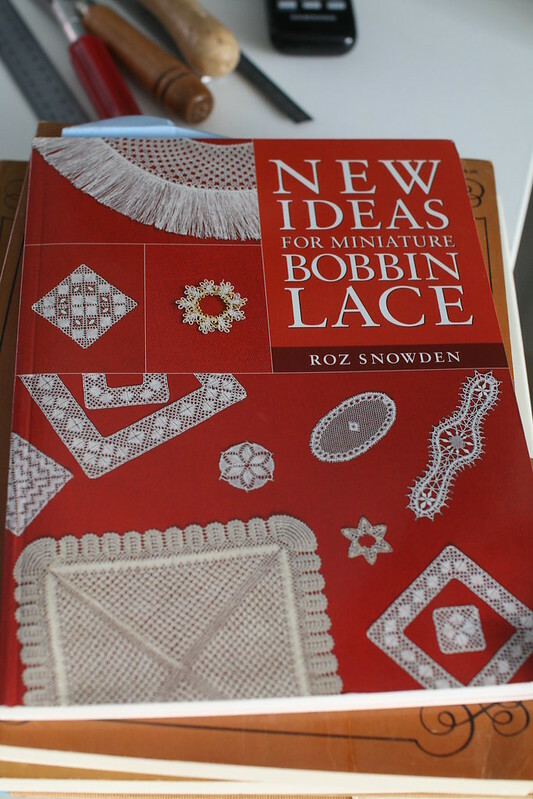 Besides I bought two wonderful books by Roz Snowden about lace in miniature and most of the items were made in Torchon. We had very long holidays – almost 12 days! I had so many plans – to make new table for my Proxxon table saw, then making jigs for it, even my husband was going to help me with my kid, but here we are. Monday! I’m afraid this year I won’t be very productive with furniture, actuallly… we’ll see, but I’m preparing for the worse scenario, while hoping that it’s going to be just fine. Anyway, I’ll show you something from the last year! It’s 3mm wide bobbin lace edging – I’m pretty happy with the result, especially with new entomology pins, they are so thin, that I realised I needed thinner cotton thread for this edging. I already used this edging for two pillows, here is one WIP. I finished the second lesson yesterday, the third one turned out to be circular border. Still learning the basics of Bedfordshire bobbin lace. Love it! I did the projects from two DVDs already, another two still waiting. I also decided to go through the projects from a very good book on this kind of lace – Introducing Traditional Bedfordshire Lace in 20 Lessons. This is the first one, I’m almost happy with it, I really liked this cotton thread, easy to work with. The piece of lace to the right – is the one from DVDs, hm, it was too early for me to work with such pattern, I didn’t quite understand several tips there at the moment, but now I would be fine 🙂 Well, almost. 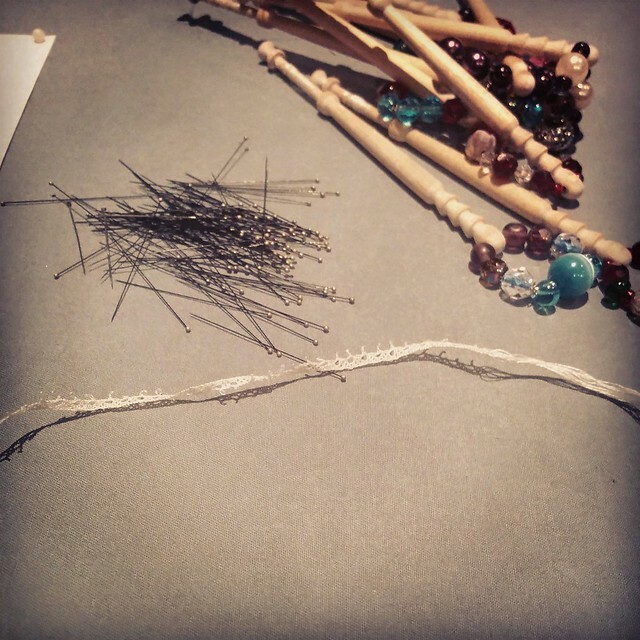 Be ready to see lots and lots of new posts about bobbin lace! Just kidding. Two packages from UK arrived just before May holidays, and I’m very excited, I think a bit too much:) Don’t know why but I especially enjoy ordering something from UK shops, they pack everything so neatly and lovely, you’ll always find a note from an owner, which is also very cute thing. Well, it’s not common in Russia, just to be clear. I’m working on commissions lately, lots of work and I practically have no time for my own projects. And it’s +20 outside, spring has come at last! Love this time of year. Recently I came across Natalia’s post about bobbin lace, I always wanted to try it, even started making my own bobbins but realized that it was taking too much time, so I dropped it. Two weeks ago I decided to try again, I ordered bobbins set and roller pillow. It was a fantastic experience for me. Though I realized that the bobbins I was using were only good for Russian (Vologda) lace, where thicker threads are used (mainly linen), and I was more interested in Bedfordshire lace. So I made two pairs of English bobbins, spangled them, I also made a block pillow, which worked just fine for me. 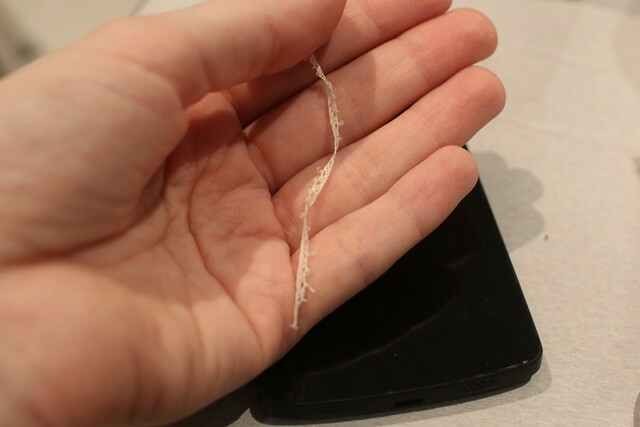 Here’s my first try with a silk thread, it’s 9 mm wide lace. 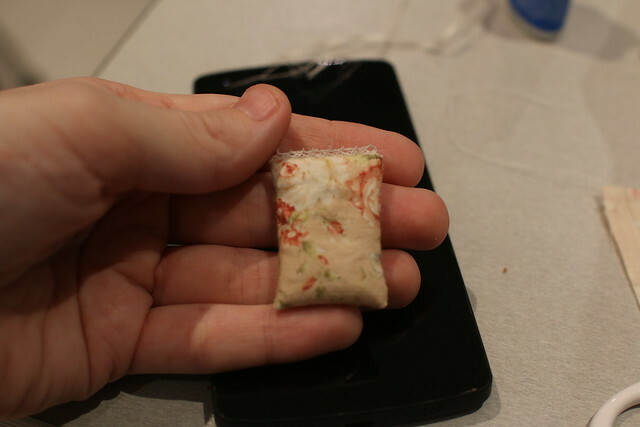 A bit too wide for this thread, but I’m working on it 😉 I decided to take it slow and learn the basics before trying to make it in miniature, so I’m afraid it will take some time to show something new.